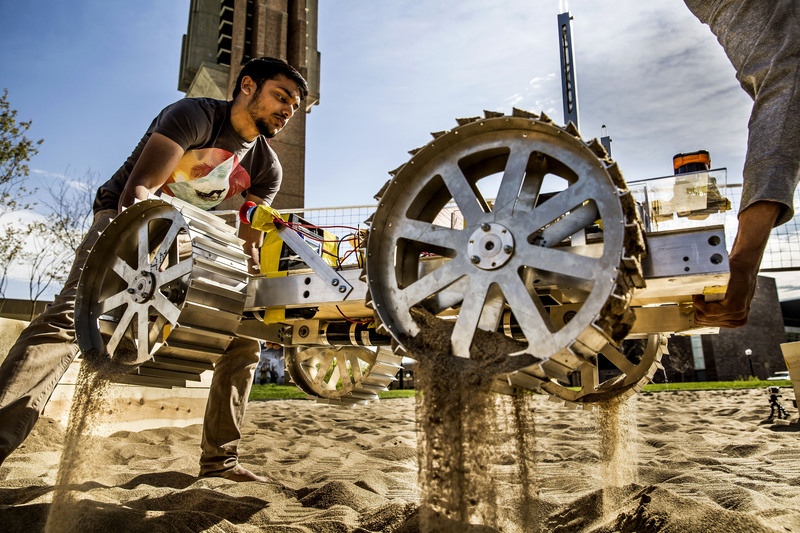 Computer science undergrads Rishi Bhuta and Adithya Ramanathan try out the Eda U. Gerstacker Grove’s new sand volleyball courts—with a robot. Built to be able to navigate a Martian environment and collect soil samples, the Robotic Exploration of Space Team (REST) Mars rover competed in the annual NASA Robotic Mining Competition in May 2017. The volleyball court’s Mars-like terrain was the perfect place for a test run. Photo: Joseph Xu/Senior Multimedia Content Producer, Michigan Engineering.